Sadly, as pointed out by the MD of MCA and HIM Insight, Jill Livesey, everyone is ‘busy’ these days. If you ask someone how they are, the likely answer will be ‘busy!’ So, we suspect not all these busy foodservice marketers will have been able to detach themselves from the office and get out to the conference, which is why we like to do an exec summary of the day for those who didn’t make it. Of course, the content of the day is far more in-depth than one blog can cover, so we would always recommend getting there yourself, but hopefully this will give you a flavour of what you may have missed. The first session of the day included representatives from EBS Group, Leathams, Britvic Soft Drinks and our long term client Ben Forbes from Essential Cuisine. The topic for discussion was how doing things differently can help brands in these challenging times. 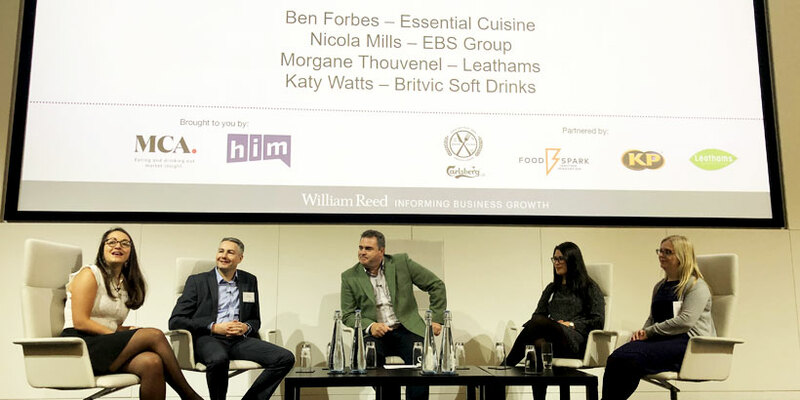 With the four panellists covering everything from bespoke solutions, comprehensive back-of-house product ranges and front of house brands, each offered a different viewpoint, but here are some of the key take-outs. Times have changed in the past ten years with more focus on suppliers to meet legislation and guidelines, to become the expert informing operators on trends and insights and providing solutions for their business that are often bespoke. As operators struggle with headwinds such as business rates, skills and staffing issues, suppliers can help by creating products aligned to operator’s specific customer needs or journey to create differentiation, they can offer consistency, versatility and often a way to reduce costs and minimise wastage. Unashamed self-publicist and restaurateur Martin Williams took the stage to share his belief in the holy trinity of marketing, advertising and PR. At the core of his vision is to create an exceptional experience for diners; which at a time when delivery is on the rise; is a very sound philosophy. Positioned at the higher end of the market, M Restaurants (who are currently also in the process of buying Gaucho) have managed to break the mould of fine dining by ‘doing different’. These initiatives include: virtual reality goggles to follow the journey of your fish from sea to plate, choosing your own seat via Google 360, dog friendly dining, customised scents on arrival and in the cloakrooms, a Himalayan Salt Chamber, electronic wine machines, beach parties, Halloween experiences, polo, rugby and F1 events with celebrities, corporate dining, a photo-booth with vanity lighting, room service for nearby properties, news-jacking to leverage PR opportunities, community creation through membership and crowdfunding, a young chef competition, hyper-targeted CRM marketing, and charity link-ups. All this in addition to top-notch food and stunningly designed interiors has made for one of the most standout restaurant concepts seen in years. Some may feel Mr Williams is a little self-satisfied in delivery, but he has every right to be, as a shrewd marketer and restaurateur he has created a concept that others would do well to learn from. His ethos in a nutshell, do things that demand attention (even if it’s a naked shot with a wine bottle!). Note no animals were involved in this session, what was covered however was the importance of digital and social media for JJ’s Foodservice. Often seen as something you give the young person in the office, Elit Rowland made the valid point that for JJ’s, social media and in particular Facebook Messenger, is a crucial tool for their customer service as the majority of their customers would prefer to message than talk to someone. The reference to wrapping a cat? Well that was the most watched YouTube video last Christmas and JJ’s are finding that YouTube (as the second largest search engine) is becoming a viable route to drive sales with the right approach by creating strong video content, sharing stories and educating customers rather than just sell, sell, sell. Ex-Barrister and curry evangelist Nisha Katona (no relation to Kerry) took to the stage to talk with Simon Stenning of MCA about her journey setting up and running Mowgli. It was impossible not to be inspired by Nisha’s drive and passion for her business, which she sees as another child and treats no less attentively. Currently Mowgli (the brand name comes from her pet name for her kids, inspired, I assume by the Jungle Book) has seven sites and will have twelve by the end of the year! The business is based around the Bengali dishes she grew up with and loves / is addicted to. Proper authentic Indian home cooking; the menu is developed by Nisha herself as founder and Exec Chef, with most dishes being gluten free, vegetarian or vegan (by their very nature), and her chefs are incentivized to ensure complete consistency. A force of nature, Nisha deserves to go from strength to strength as she is an intuitive marketer who listens to what her customers want and has a compelling brand story matched only by her magnetic personality and stunning on trend menu – little wonder TV and radio are queuing up to have her on. Having seen her speak and sat with my mouth watering at her food shots, I for one am starting the campaign to bring Mowgli to Surrey and will definitely be visiting next time I’m in Oxford. Filmed prior to the day we heard from EAT’s Arnaud Kaziewicz, Director of Food and Beverage and Marketing Director Holly Oades, on how they are developing a joined up approach to food and marketing by applying a chef led food to go positing to the brand, built on three key principles of excellence in customer service, tasty food and drink, and a great atmosphere in store. With small changes like putting Arnaud front and centre on in-store branding so consumers can immediately see the menu is chef developed, to changing the baguette supplier; things at EAT are changing. From Instagramable meal kits to more nuts and bolts operational training on consistency, EAT aims to ensure that it stands out on the high street with regularly refreshed seasonal menus, with the whole business involved in food development, as well as the consumer via social media feedback. In a crowded market, EAT, it would seem, is committed to being the brand to offer chef-led food to go that is a cut above the rest – a laudable goal and one we wish them every success with. Personal brands are big business and Kamila Sitwell has used her industry influence to launch her range of personalised premium soft drinks – Kolibri. Inspired by a trip to the spa with girlfriends, where it was apparent everyone had their own particular taste when it came to soft drinks, she went on use her background in insight with a major soft drinks brand to set-up on her own. As a solely on-trade brand aimed at the top end of the market, she leveraged her industry network and set about growing her social reach via LinkedIn, Twitter, Instagram and Facebook with engaging content including, opinion pieces to position herself as a thought leader. By creating a personal brand in the modern online world of hospitality she has successfully launched her premium range of drinks and urges entrepreneurs to make the most of their personal credentials and network as part of their business strategy. This panel discussion featured up and coming brands Mother Clucker, Yard & Coop and Bleecker Burger. These guys may not class themselves as traditional marketers (Yard & Coop being the exception) but it is clear they are intuitive marketers. From test-bedding areas via Deliveroo Additions to engaging with local bloggers and even in the case of Bleecker Burger, employing one of their social media advocates to do their marketing. The challenges of scaling up is common across all operators, but as the brand grew, Brittney of Mother Clucker made the smart move to ensure their social retained authenticity by giving it to someone on the ground rather than her and her co-founder, thereby ensuring the tone remained true to the brand, allowing fly-on-the wall posts across their social channels. They also have a company wide WhatsApp group where anyone can feed in content for social media and recommend finding niche audiences and bloggers as with Mother Clucker’s halal following. While Yard & Coop made it clear that his approach to marketing is less about broadcast messages and more about capturing, engaging and rewarding consumers. All sound advice from those that have been there and bought the branded merch! 59 Club took us through their approach to maximising revenue through training staff to up-sell across beverages and courses. It’s simple, if staff are recruited for their likeability, and training on engaging and up-selling customers is provided, operators can effectively maximise spend from the footfall they capture. Josh Ford of MCA took us through the latest from our insight hosts. Their latest consumer driven survey highlighted the importance of responsibility in all its forms from provenance to health and environment. With a decrease in alcohol consumption, meat consumption, single use plastic and converse increase in vegetarianism/vegan options with consumers stating they definitely see themselves moving towards more environmentally responsible eating – responsibility looks to be top of the agenda. Indeed, there has been a 14% increase in mentions of British or places in Britain on menus, showing an increase in interest for more British centric sourcing in the face of Brexit. However, provenance isn’t just about British. Authentic dishes and more specific regional cuisine mentions, along with street food (which his growing at 9%) are also on the up. Whilst technology’s role in aiding speed of service and customisation is also impacting the market with bill paying and ordering apps to help avoid wait time. AR, delivery and funky food halls are also interesting trends going on in the market. And on a final note with an aging population will meals on wheels be old hat? Will the future see us embracing Uber Eats for the elderly, delivering them what they want, not just what’s on offer, as has been seen in the US? Lots of food for thought as ever from MCA. Searcys’ journey started back in 1837 as one of the first catering companies founded by John Searcy – master confectioner. Since then they have gone from strength to strength and are synonymous with some of the most glittering landmarks, experiences and champagne bars around. The challenge was to contemporise the brand without losing its heritage and values. Anna Fenten had this task and with the help of consumer insight and a thorough brand positioning piece has managed to pin down their target audience to ‘aspiration connoisseurs’ who are predominately ABC1 female and go out 123 times a year (far more than the average Joe). The brand insight highlighted the importance of the need to feel special and the’ irresistible superiority of product’ as well as their unique association with Champagne and English sparkling wines. By aligning the brand to these clear values along with focusing on marginal gains Anna has succeeded to sensitively bring the brand into the present day and the fact that they have just won the contract for Alnwick Castle where it all began with John Searcy must be the cherry on the top. With talk of Millennials (24-34) waning and the march of the Gen Z upon us (13-23) Chloe Combi took us through an enlightening view into these digital natives and their world. Indeed, it was so enlightening that Cass has written a blog on it! As ever it was a great day and I am sure all the delegates went away with a few clear actionable take-outs. Well done to the team at MCA, we look forward to next years. Hopefully if you didn’t make it this year this blog will have whet your appetite enough to sign up for 2019.